Escape to the winter wonderland at the Bar W Guest Ranch in Whitefish, Montana. As the temperatures lower, the nights get cooler and the snow begins to fall, a whole new playground awaits visitors. On your winter dude ranch vacation, you will find that the Bar W and the Whitefish community have it all. Stay with the Bar W for an elegant and relaxing bed and breakfast surrounded by the pine-covered ridges of Spencer Mountain and the peaceful winter of Montana. Guests can wake up to the inviting smell of hot coffee and a fresh breakfast. Only four miles from town, the Bar W is the perfect location to feel miles away from civilization but have the charming town of Whitefish just around the corner. New for 2014, guests can take their winter adventure getaway to a whole new level. Rent the entire lodge as a vacation home. Make our home, your home. Your cozy bed and breakfast is not just a vacation anymore it’s like going home to put on your favorite pair of slippers. Looking for more than just luxury lodging; our staff is happy to help arrange outdoor adventure activities. Head into town to grab a pair of cross-country skis or snowshoes and explore the endless trails. Rent snowmobiles and ride the mountainous terrain that surrounds Whitefish or enjoy an exciting dog sled ride to appreciate the untamed wilderness of Montana. The winter landscape becomes a skier’s paradise. Whitefish Mountain Resort, recently named 7th Top Ski Town in the World by National Geographic and the 2nd in the United States, is only seven miles from the ranch. Only minutes from incredible slopes, The Bar W is perfect for guests wanting to hit the area’s signature slopes for an all day skiing or snowboarding adventure. Adventure for the whole family is just outside your front door at The Bar W Guest Ranch. 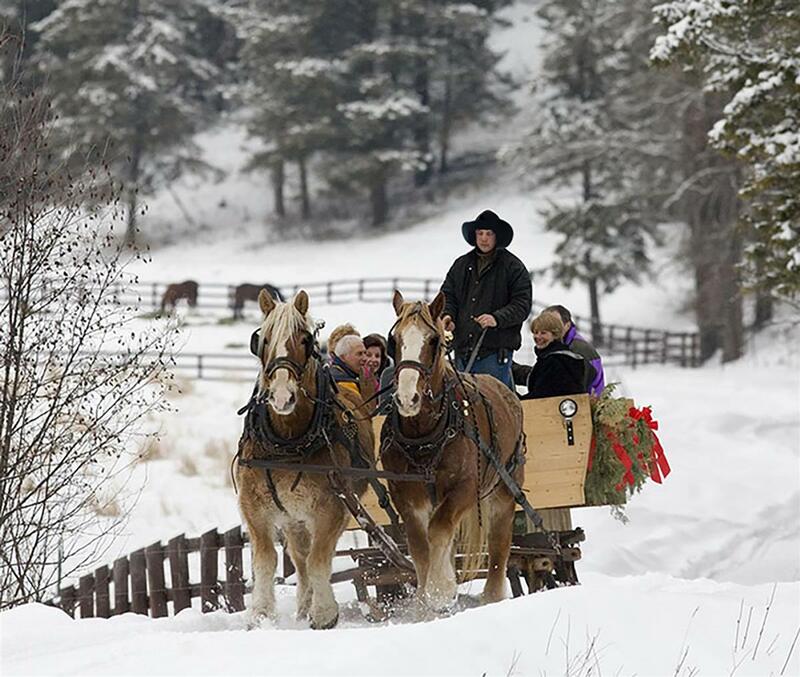 Sleigh rides to take you back to a simpler time, a time for family and friends, a time to relax and let the beauty that surrounds you soothe your soul. You don’t have to be a guest to visit for a sleigh ride! The Bar W is offering three sleigh rides a day, seven days a week. On top of an exciting sleigh ride, guests can experience a sleigh ride chili dinner or a sleigh ride followed by a delicious dinner in our lodge. Sleigh ride dinners are served family style and are the perfect family bonding experience for all ages! Go dashing through the snow in an open sleigh behind one our elegant draft horse teams or cozy up in our lodge for a relaxing bed and breakfast stay. Either way, the Bar W is sure to please. Don’t wait, come experience a true winter wonderland at the Bar W.